FILE - A man walking between tents at Australia's regional processing centre on Manus Island, in Papua New Guinea. The future of hundreds of detainees held in an Australian-run migrant camp in Papua New Guinea is in limbo after a court ruled the facility was operating illegally. Papua New Guinea’s Supreme Court said the center for asylum seekers on Manus Island breached the right to personal liberty under the South Pacific nation’s constitution. A panel of five judges at Papua New Guinea’s Supreme Court has ordered that immediate steps be taken to end the detention of asylum seekers in the Australian-sponsored camp on Manus Island. They court said that the 850 male detainees were being held illegally because their freedom of movement was being restricted. The judges insisted that the detention breached their fundamental human rights as guaranteed by various international treaties and the Papua New Guinea constitution. In response, the Papua New Guinea Prime Minister Peter O’Neill announced Wednesday that the center would be closed and that Australia would have to “make alternative arrangements” for detainees on Manus Island. The ruling is a blow to both the PNG government, which had supported the detention facility, and to Australia. The offshore processing of asylum seekers in camps on Manus Island and the tiny South Pacific republic of Nauru has been a key part in a strategy to try to deter migrants from travelling to Australia by boat. The mood among inmates is reported to be jubilant but there is also apprehension about what happens next. FILE - Protesters react as they hold placards and listen to speakers during a rally in support of refugees in central Sydney, Australia, Oct. 19, 2015. Australian Immigration Minister Peter Dutton says his country will not resettle any detainees held in offshore camps because it would simply encourage more asylum seekers to make the hazardous sea crossing to Australia. The center on Manus Island was originally opened in 2001 by Australia's Conservative Prime Minister, John Howard, in response to a flow of unauthorized arrivals arriving in Australian waters by boat. The facility was mothballed within three years, but reinstated in 2012 by a Labor government keen to promote uncompromising border control measures ahead of a federal election a year later. The offshore processing of asylum seekers remains a contentious issue in Australian politics. While both major parties support the use of camps in the South Pacific, critics say conditions are inhumane. 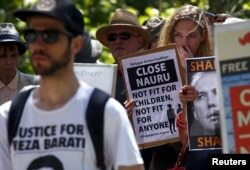 On Wednesday, officials on Nauru said an Iranian refugee was fighting for life after setting himself on fire in what they have described as a “political protest”.